prolight+sound is the international trade fair of technologies and services for entertainment, integrated systems and creation. The high level of internationality and the extensive spectrum of products and services are the key factors behind the success of this event. 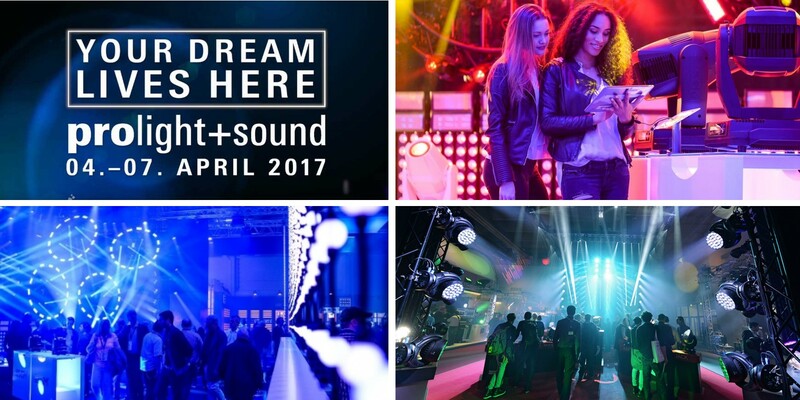 More than any other fair, prolight+sound offers a comprehensive overview of all products and services for the event sector. The high level of internationality and the extensive spectrum of products and services are the key factors behind the success of this event. At the 2017 National Association of Broadcasters (NAB) Conference, Gearhouse Broadcast USA will debut Columbus, the first mobile unit based in the U.S. to feature a full 4K monitor wall, “one button” hydraulic deployment, and integrated RF (mast included), among other unique attributes. The arrival of Columbus reinforces the company’s increased commitment to ongoing expansion in North America. With the addition of this premier production solution, Gearhouse Broadcast USA augments its wide range of existing offerings for broadcasters, studios, networks and production companies throughout the U.S., Canada, Latin America and Caribbean. Ross Mobile Productions (RMP) is a national mobile production company that offers full-service production packages and rental services. Designed around a tightly integrated Carbonite Production Switcher and XPression Graphics core, each RMP FIN vehicle delivers fiber and Triax camera capabilities, an advanced communication system and a dual-user eight-channel replay system. This incredible production power enables RMP’s Mercedes Sprinter-size vehicles to deliver high-quality, network-level productions at affordable prices and meet consumer demand for coverage of more local sporting and other live events. Currently, RMP’s trucks do productions in more than 30 States, and, this year alone, have aired on four major US cable networks and in more than 100 countries. Until recently, WebStream Sports was an independent provider of remote broadcast, in-venue and studio production. Starting out in 2006, the Indianapolis-based business had focused primarily on live sports, spent nearly a decade in high demand for its reputation for high-quality sports productions, and achieved remarkable success in a relatively short time. Fast forward to 2015. Part of a much – much – larger company, suddenly its “little engine that could” beginnings were behind it, and the stakes for growth in a high-profile organization were greater than ever. That meant the production technology it chose needed to deliver reliably – and affordably, even at scale. Celebro Media has five studios at its central London location with further facilities in Moscow. By Autumn 2017, Celebro Media will have completed works on an additional five studios in London and two in New York. Also, Celebro Media has recently begun trials of a new OB service that allows multi camera switching down a single transmission line. The service is currently being offered to international broadcaster on a trial basis. Celebro Media specialises in live production, providing studio space, galleries, uplink facilities, staff and everything required producing and transmitting live content. Global broadcasters such as BBC World Service, MTV and TRT World all use Celebro Media’s studios. TEN broadcast facilities have been in the inner city suburb of Pyrmont since 1997. These studios feature a large open plan newsroom and news-set where all Ten's national and local Sydney news bulletins are produced. This facility is also the network's head office and broadcasts the network signal to other cities. When TEN-10 opened in 1965, it operated from newly built studio facilities at North Ryde, these were sold in the 1990s when the network underwent financial turmoil. The North Ryde complex, which was used by Global Television in recent years, was demolished in September 2007. Following the move from North Ryde in 1990, TEN relocated to a small warehouse in Ultimo, followed by their final move to the new studios in Pyrmont in May 1997. Most series are produced on location or at external studios by external companies, but a few programs are made in-house by TEN. Set against the backdrop of Porto’s ancient architecture, the city’s Red Bull Air Race debut in 2007 drew thousands of spectators to the sun-drenched beaches. The 2017 stop will mark the final racetrack over water this season, and the trajectory over the River Douro is likely to be twisting and tricky. While current pilots Kirby Chambliss of the USA and Matt Hall of Australia have captured podium spots in Porto (2008 and 2009, respectively), neither they nor any of the other 2017 contenders has ever clinched a win in Portugal’s second-largest city. Following Porto, tension will be high as the 25-meter Air Gates rise on the infield of the Lausitzring. For the second season in a row, the 370-kmh showdown at the oval will be the last in European skies before the World Championship accelerates to its climax in the USA. Even before the umpire blows his whistle for kick-off the spectators inside the stadium have already followed a variety of TV-entertainment with live coverage, information, and advertisement via modern LED screens. This includes the Stuttgart Mercedes-Benz-Arena and the fans of soccer club “VfB Stuttgart”. Right on schedule with the start of the second half of the season of the National Soccer League Germany the new wireless camera technology was made available at the stadium. This was planned and designed by HDwireless of Mechernich near Cologne, and installed as commissioned by “Netze BW GmbH” who are the operators of the stadium audio and video technology. On 5 February Houston, Texas played host to the NFL’s Super Bowl LI, fought out between the New England Patriots and the Atlanta Falcons at NRG Stadium. Entertaining the crowds in the hotly anticipated Pepsi Zero Sugar Halftime Show was Lady Gaga, whose high-octane performance earned the respect of millions in an intense 13-minute spectacular that was viewed by over 115 million people worldwide. The show was another world-class collaboration from co-production designers, Bruce Rodgers of Tribe Inc. and LeRoy Bennett of Seven Design Works, and lighting designer, Bob Barnhart of 22 Degrees. Both Bennett and Rodgers had a message to convey through their design and, with the eyes of the world watching, helped Lady Gaga restore a sense of unity and deliver a performance that was both uplifting and determined. Adlib continues its work with top comedians having just supplied full production – sound, lighting and video – for Jack Whitehall’s sold out, 3 week ‘At Large’ UK arena tour. The Liverpool based company was delighted to be on the road with one of the UK’s most exciting and successful talents having previously supplied production for his ground-breaking 2014 arena tour which was staged in the round. Having appropriate production in the right proportions and places is a key to delivering comedy on a large scale. It is about presenting this very intimate and personal style of entertainment & communication and ensuring that audiences in larger venues enjoy all of the same essential experiences of a one-to-one scenario. Blackburn UK based HSL was chosen by production manager Mike Clegg as the lighting equipment supplier and Andy and his crew worked closely with Dave Whiteoak of Video Illusions, who supplied and co-ordinated the screens and camera package. Andy commented, “Jordan Hanson, in the HSL office, did a great job of project managing the lighting supply and an absolutely top crew on site was chiefed by Ian Stevens. They worked very hard ensuring the installation of a complex lighting rig ran as smoothly and efficiently as was possible in a very short space of time”. The Fire Department of New York (FDNY) – the United States’ largest fire department – recently deployed a live broadcasting platform to aid in situational awareness for fighting fires. The platform was custom-built by Mobile Viewpoint and its US partner company, KenCast. The platform transmits video via the Mobile Viewpoint Streamur iPhone app to the KenCast end-user platform by using three iPhones – each paired with a cellular hotspot – to broadcast password-protected live feeds to users on any PC, Android or iOS device. The brand-new Brio replaces Dome Productions' 15-year-old previous desk, launching the company into a new era of power, flexibility, and usability in the broadcast of live sports events. Dome Productions went live with the Brio last September as part of an extensive upgrade of its main Studio95 facility, located in the Rogers Centre in downtown Toronto. Installed in the studio's control room, the Brio is used in conjunction with the mobile units for "remote-at-home"-style broadcasts. The Brio's compatibility with the other Calrec consoles gives Dome powerful new flexibility in configuring audio mixing for various productions. As productions grow in size, Dome is able to expand the studio's capabilities simply by adding more Calrec Hydra2 Fieldboxes. Located on the San Diego State University campus, KPBS Public Media operates three media organizations out of a single production facility, including NPR radio station KPBS-FM, PBS television station KPBS and the online news website KPBS-Digital. With so much media being created under one roof, KPBS needed a broadcast mixing solution that would streamline production and enable the separate news divisions to seamlessly share original content. After careful consideration, KPBS made the decision to replace its legacy digital mixing console with a complete Studer by HARMAN broadcast audio mixing solution. Probably the best way to describe the HPA (Hollywood Professional Association) Tech Retreat is one part creative, one part IT (information technology), one part CFO (chief financial officer) and one part networking. The HPA, which is now a part of SMPTE (Society of Motion Picture and Television Engineers), isn’t confused, it’s just focused on how they can squeeze all of those subjects into four days. Citing a recent PayPal study, Pete Putman, of ROAM Consulting, noted that 58 percent of folks out there watch their content on their phone, followed by a tablet. I guess the rest are stuck with a TV set. While YouTube and Facebook Video fill in the awkward silence periods, Netflix has the U.S. SVOD (subscription video on demand) market where 75 percent of the viewers stream their media.